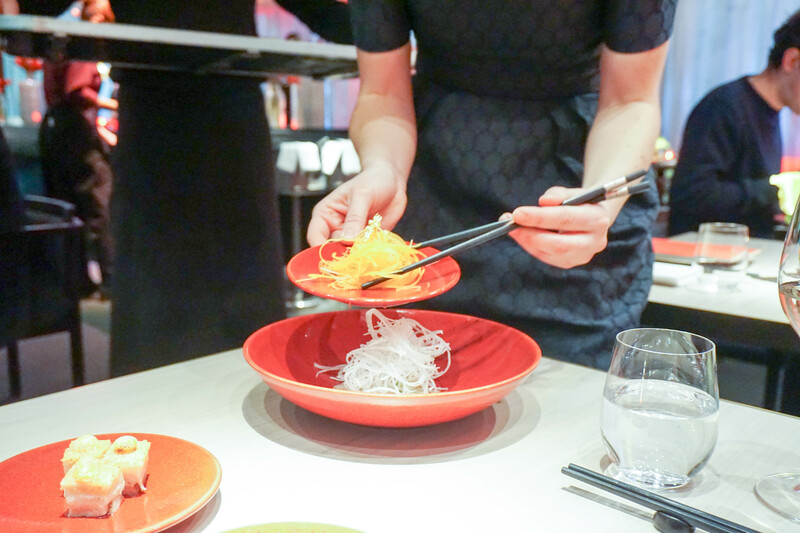 8 courses under your belt, and Peking duck personally carved in front of you. I’ve previously noted my fondness for HKK in my initial post here. 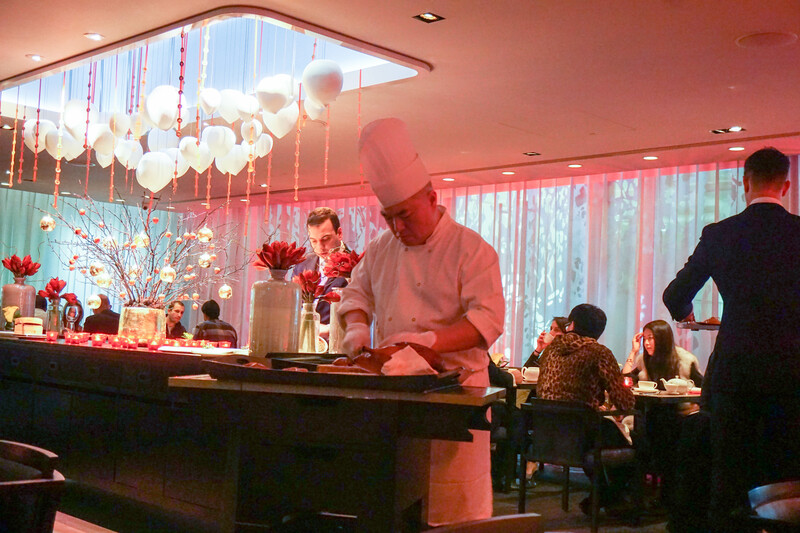 HKK boasts a compelling dining experience from traditional Chinese dishes to high-end quality courses of fine calibre. Opened in 2012, it was the latest of the Hakkasan Group but was very quick to impress, with its culinary string of tasting courses. Today is Chinese New Year’s Eve, a day of festivity and culinary celebrations. 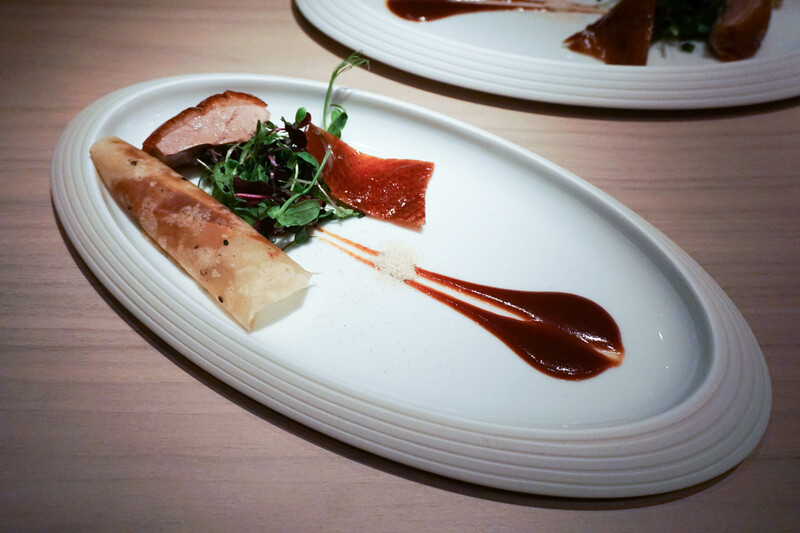 HKK has geared up a tailored set menu for the new year inclusive of its famous Peking duck. The room is lit with warm red lighting and highlighted with subtle Chinese New Year decorations. 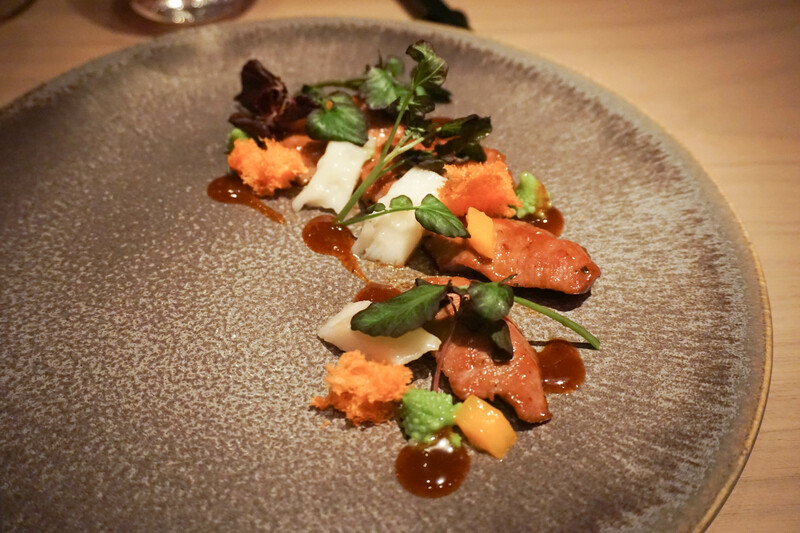 Described as innovative, their menu consists of a 8 course tasting menu priced at £88. A vegetarian set menu is also available with more information on their website. To begin with you’re served the ‘prosperity platter’, prepared by the waiters in front of you. 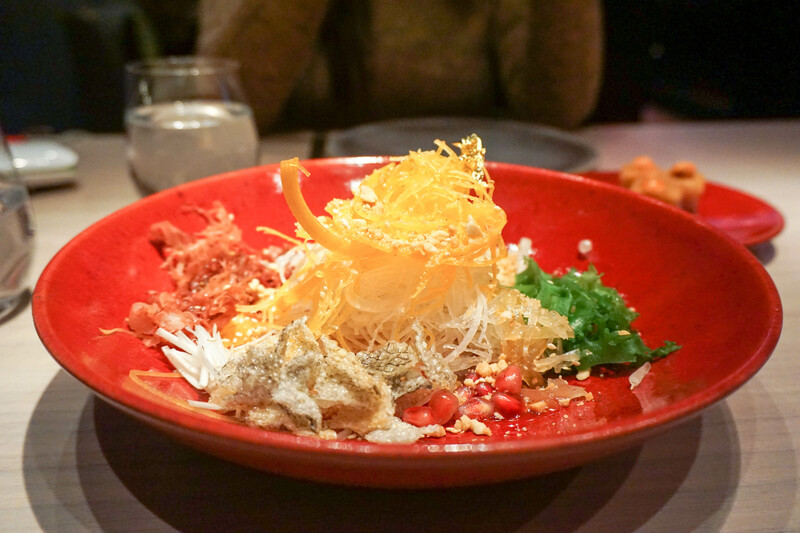 The bowl consists of glass noodles, pomegranate, pomelo, crispy salmon skin and other constituents. They say ‘the higher you toss the prosperity platter with your chopsticks, the better your luck and happiness will be for the year ahead. The salad made a light starter, giving an insight into what’s to come for the evening. 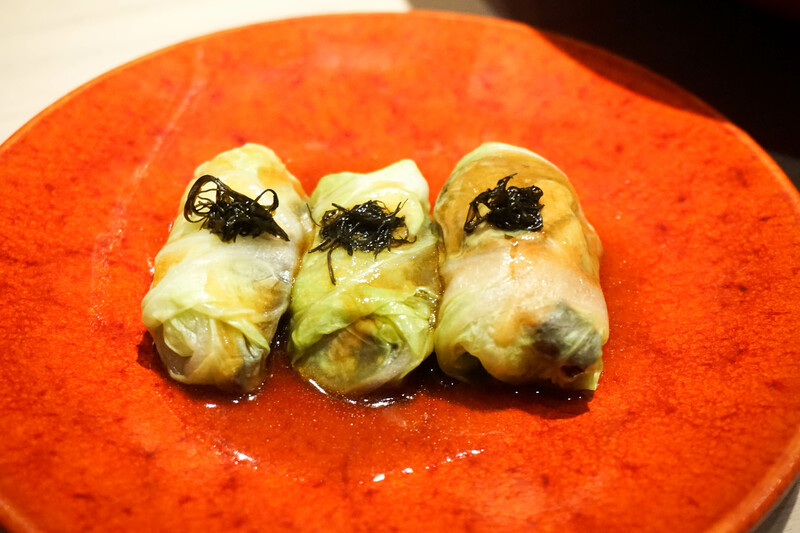 Alongside the salad bowl, lettuce wrapped oyster rolls and pork belly are served together to complete the full starters course. 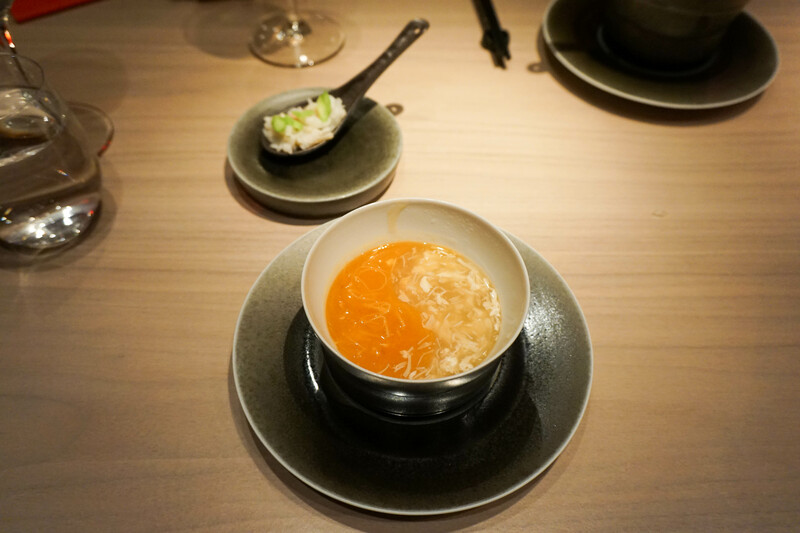 The two soup course consists of crab meat and kumquat and a vegetarian ‘shark fin’ counterpart. The soup are cleverly separated into the symbol of the Yin Yang by its colours, representing peace and togetherness. The making of shark fin soup is a controversial one, in which many restaurants do not serve it given the ethical issues surrounding it. 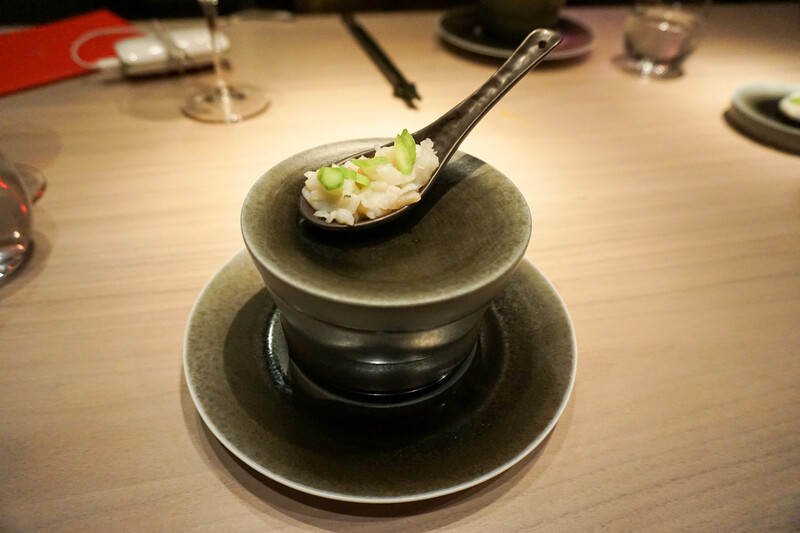 The vegetarian shark fin soup at HKK is something similar to a soy based mushroom broth. The soup here is very intricately made, with each mouthful as flavourful as the other. Presentation was also the key feature here resulting in a very theatrical display. 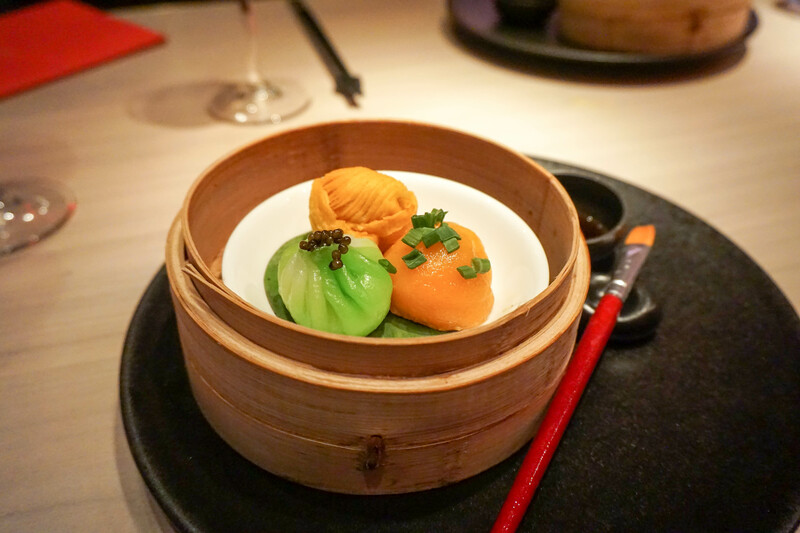 The dim-sum becomes a bit of a plaything, using the paintbrush as an intermediary between the soy sauce dip and the dumplings. 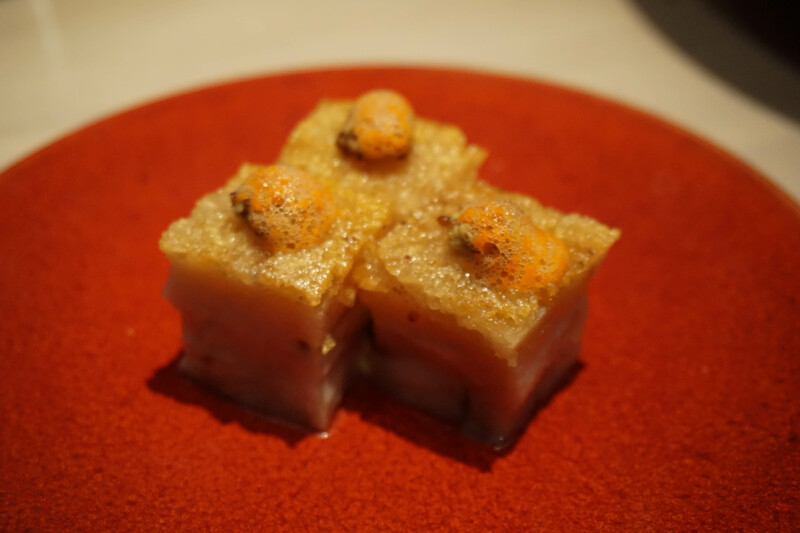 The turnip pastry was finely constructed and delicate, made with layers upon layers of pastry. Following traditions, eating dumplings on Chinese New Year is thought to bring good luck. Filled with dover sole, foie gras and black truffle, a very memorable dish for all. 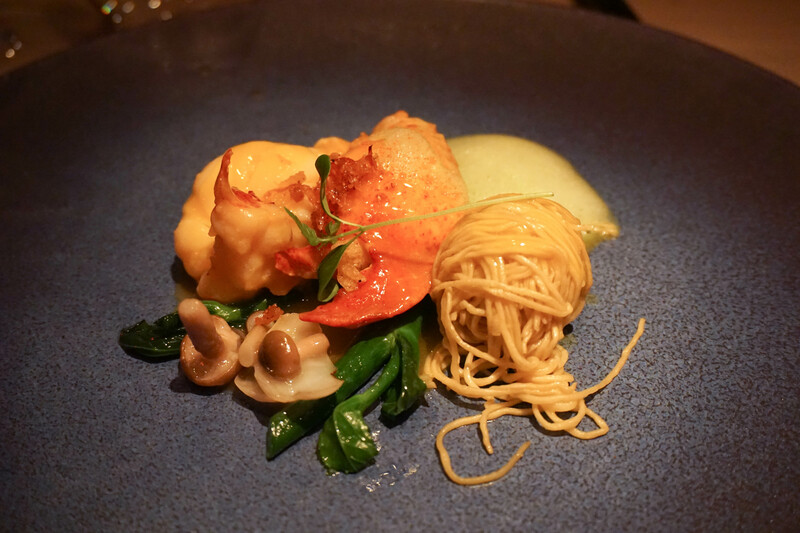 Considered a very luxurious dish in the past, it was made for scholars and a dish of grandeur and royalty. 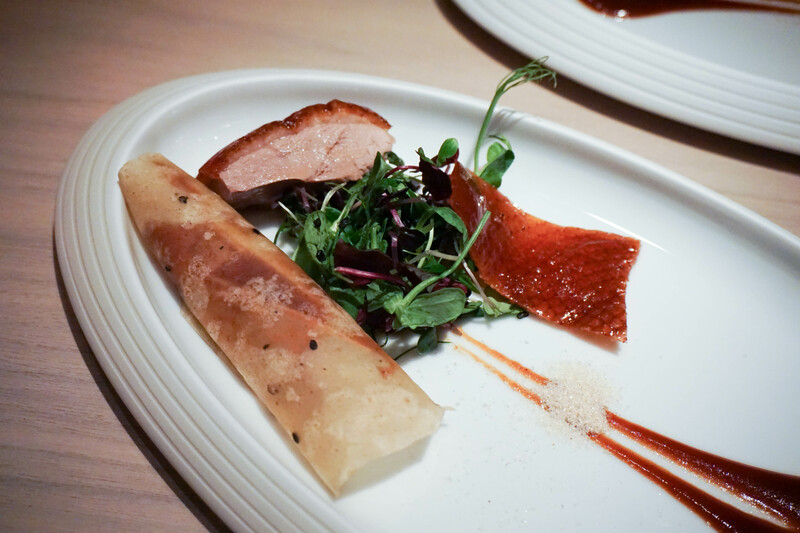 Both tender and crispy parts of the duck are provided for extra exquisite touch. Instructed by the chef to eat this chronologically starting with the skin dipped in sugar and hoisin sauce, duck breast, and lastly the pancake. There is a subtle sweet taste to the duck, with a mount of brown sugar as an available dip. 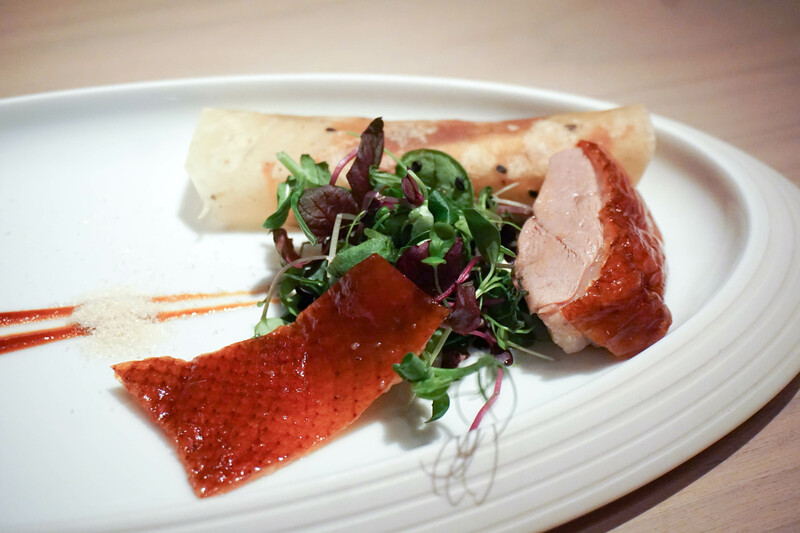 This adds to the already aromatic taste of finely roasted duck, its tender and moist flesh. 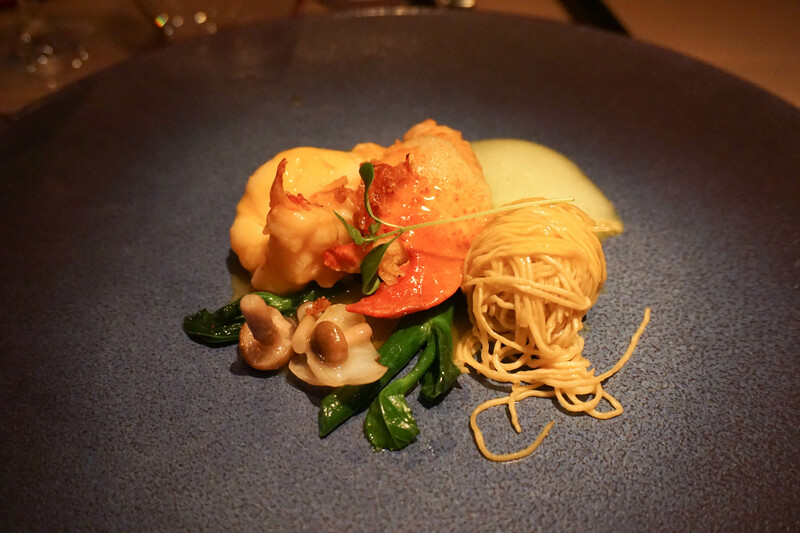 Second main to the 8 part course were the lobster noodles. Representing unity and longevity they’re nicknamed the ‘sea dragon’, thought to bring good fortune per Confucius sayings. First impression would lead you to believe the portion is rather small but the egg noodles are delicately wrapped and rolled into a bundle. 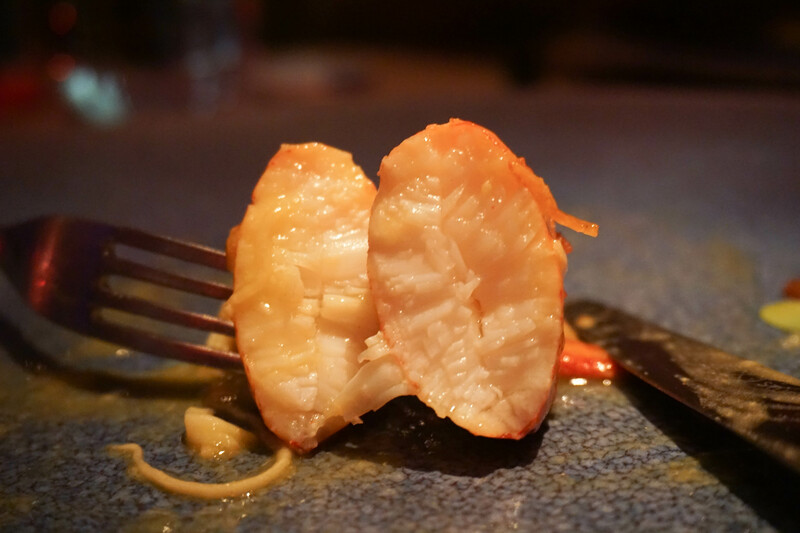 The lobster meat is generously served with high quality flavouring and in XO sauce. Sichuan mala lamb was the surprise of the evening. Stemmed from arabic origins and developed with a sichuan twist. Complemented alongside sticky jasmine rice cakes was nice touch to end the mains of the evening. 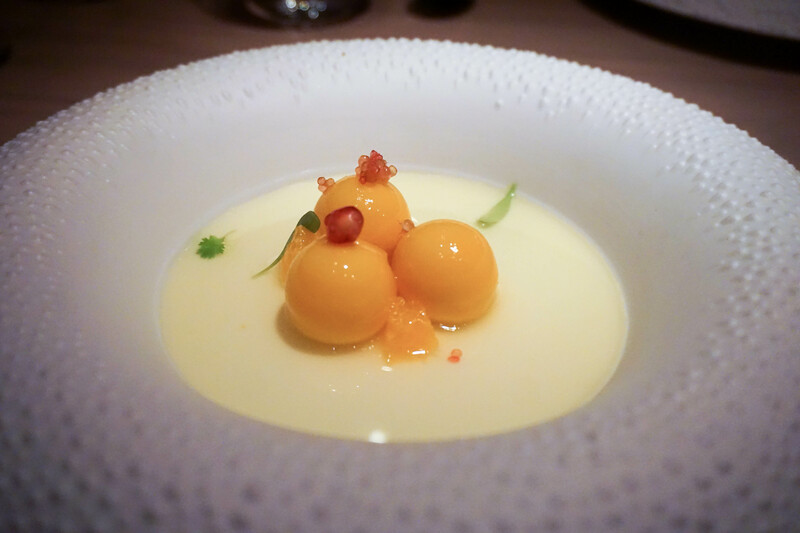 The desserts I had last time at HKK were good, but did not impress. 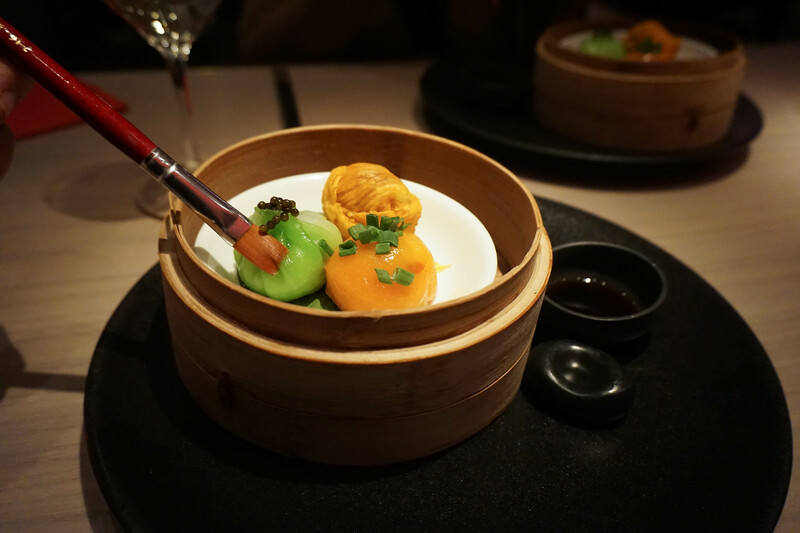 The vanilla and mandarin dumplings were aromatic in nature and melted in your mouth. Cold but delicate shell outlined around a smooth ice-creamy texture inside. 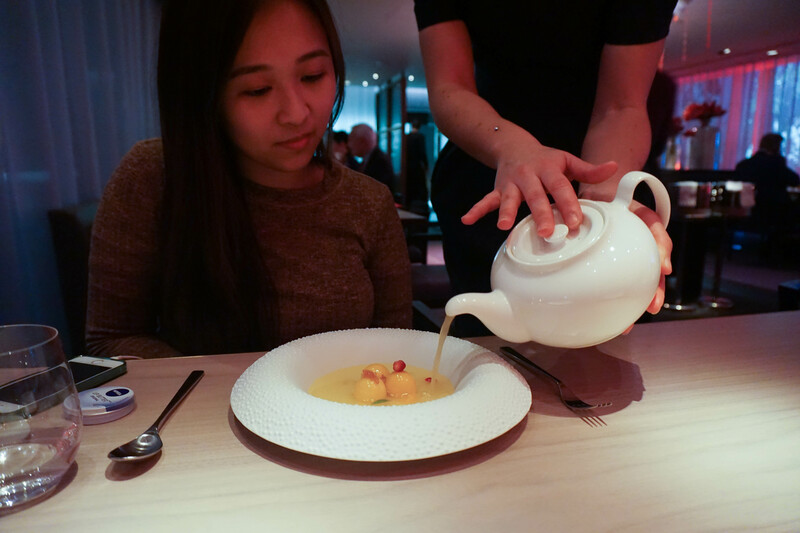 HKK’s artistic approach to its dishes continue with a teapot osmanthus infusion. A light and refreshing dessert to finish off with. The last dessert, sweet yet sour. It dessert name in Chinese represents the meaning of peace, which is taken here in so many different forms. A traditional ingredient for the Chinese during this time of year, the green apple. Cubes of spongy cardamom cake and crisp apple noodles gave the extra kick to complete the highly theatrical affair. 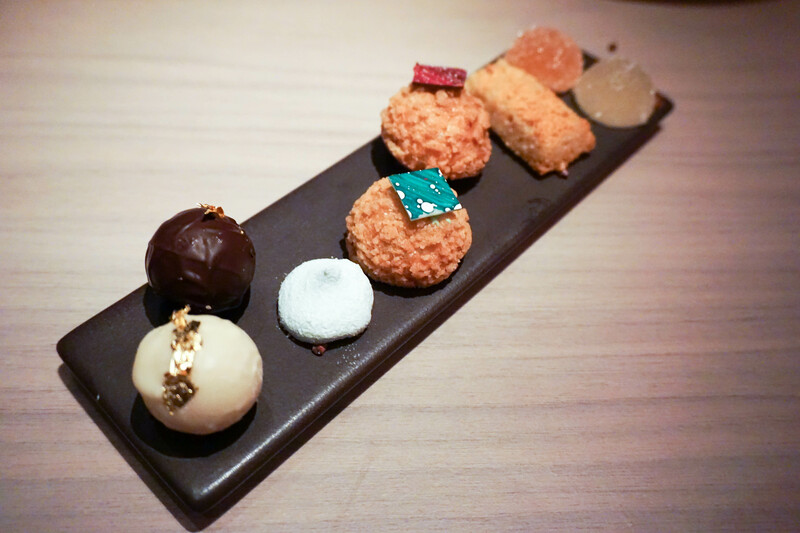 Petite fours… became petite eight. 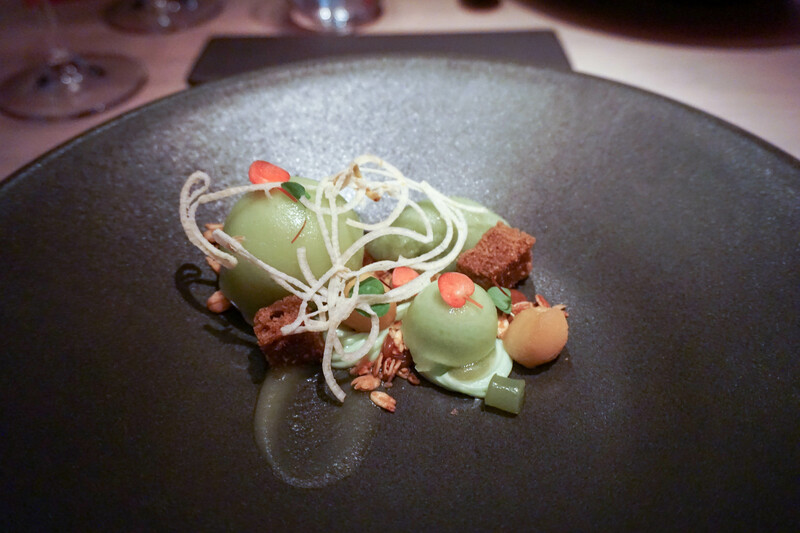 The pandan choux is a notable favourite.